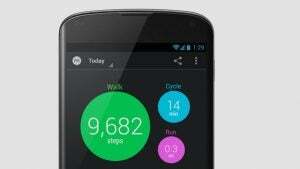 Forget Fitbit and Fuelband, here’s an alternative way to track daily activity from your phone. Moves is essentially an activity tracking app hoping to get you in better shape day by day. Initially launched for iPhones and iPads at the beginning of the year, the Moves app has since been downloaded more than 2.5 million times. Now it has landed on Android and is free to download from Google Play to track running, cycling and walking. Setting itself apart from the bucketload of paid-for fitness apps and wearable tracking devices like the Fitbit One, Nike Fuelband and the Withings Pulse, data is presented in much more user-friendly way. With Moves, it is all about simplicity. Some people might be put off by fitness apps that bombard you with data, so Moves takes a slightly different approach. What you get is a very basic-looking app that presents activities as a ‘storyline’ or timeline of your day. The app makes use of sensors (like the accelerometer for instance) already built into your smartphone along with GPS and Wi-Fi to distinguish between different activities and locations. Data is pushed to servers to analyse the information, which does mean there is some mobile data use involved. This apparently equates to around 30MB of data per month. The app can be used without a data connection as well and simply analyses the data when you are connected again. There’s very little to the UI. There’s the ‘storyline’ you can scroll down and a series of circles up top that you can tap to see how far you have walked, how long you have walked for and how many steps you’ve made. There’s a tab to let you view data from the current day, the previous day or a specific day to monitor progress. Settings are pretty minimal, although you have the ability to minimize battery life use when stationary, you can select metric/imperial units and choose to receive daily summary notifications. There are a few features that the Moves Android app lacks in comparison to the iOS app. There’s no calorie count for starters. What’s more disappointing is the lack of app support. So, unlike the iOS version, you can’t currently feed data into apps like TricTrac and Bounts. The great thing about Moves is that it utilises something you are always likely to have in your possession, a phone. There’s no wrist-worn device to remember to put on in the morning or pod-shaped tracker to potentially fly off your trouser waistband. You can launch the app and sling the phone into your pocket or bag and it will run in the background. As you begin to move, you’ll see the different activities laid out in the simple, clean-looking UI. For each section of your journey, you can tap to see the data laid out in Google Maps. Accuracy is obviously a prime concern and putting it up against the Withings Pulse, there was around a 200 step count difference. We took it out for a run along with the TomTom Runner GPS Sports Watch and again it was largely in the same ball park in terms of recording distance and run duration. We did experience some problems when using the app indoors, specifically the gym. Testing the Moves app on an exercise bike, the app simply did not register the movement at all. It wasn’t ideal having to have the smartphone in our short’s pocket either. The lack of a 3G connection meant waiting until there was a clear reception to sync data, but the app simply did not recognise any of the activity. Moves isn’t 100 per cent reliable. As is the case with most apps that rely heavily on GPS, Moves willl do some damage to your phone’s battery life. The app developers do make this point clearly and suggest charging it overnight to make sure it goes the distance. You can choose to minimise battery consumption when stationary to help matters as well. If you are planning to go on regular runs with the Moves app and do pretty much nothing else on your phone, then you are probably going to be fine. The reality is, it will hit battery life quite hard if you are running other apps. Using the Moves app with other apps like Twitter and Spotify in offline mode from 8.30am, the battery level was below half by 11.30am. The Moves Android app won’t instantly make you fitter, but that’s not really the idea behind it. It’s more about making you think about getting healthier in a more gradual way. You can begin to get a clearer picture of your day and areas where you might be able to fit more exercise in. There are some issues. Notably the indoor tracking and the battery life issue. If you are planning to use other apps during the day, which let’s face it, most people will you will need a charger handy. If Android phones had something in the way of the M7 coprocessor featured in the iPhone 5S, this could potentially help take the strain off the phone battery. It’s a good start, and for someone who spends most of their time exercising outside or not ready to buy a dedicated fitness tracking device, Moves is an Android app worth taking a look at. The post Moves appeared first on Trusted Reviews.